In honor of National School Counseling Week, we are highlighting each of our school counselors all week long. 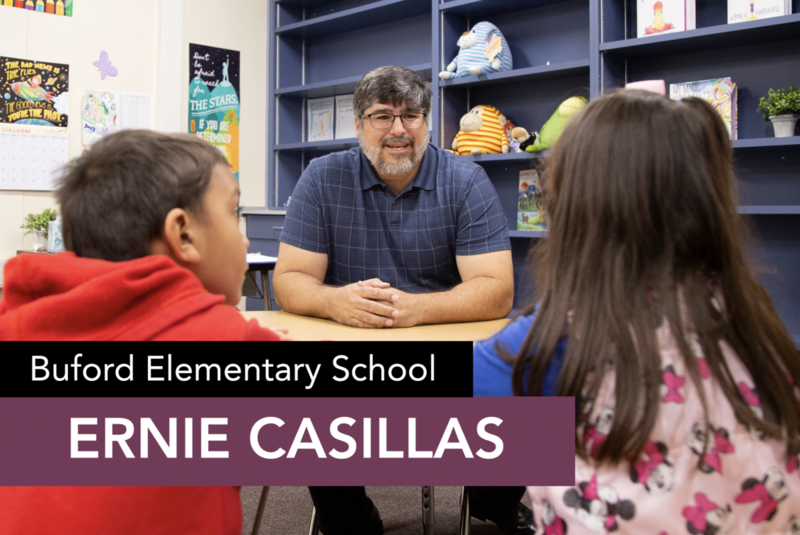 As the counselor at Buford Elementary, Ernie Casillas has numerous responsibilities, but the one aspect of his job that is most vital and rewarding to him is the daily counseling sessions with students. These services are so important at Buford Elementary that they have created a program in a designated room that is utilized just for mental health services. Known as the Reflective Learning Center, they have created a safe, student-friendly atmosphere where he and other mental health staff members encourage students to freely express their thoughts and emotions during the counseling process. Through the relationships that have developed in this program, Buford has created a caring personal bond that allows students to feel a strong connection with the school. The effects have resulted in more student effort in the classroom and also healthy friendships with classmates. Way to go Mr. Casillas! !